Sorry I have been out of contact for the last few weeks. We have been in-and-out of hospital and haven't had a moment free. 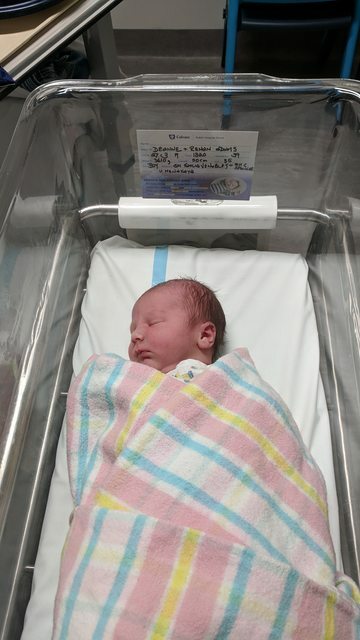 However, I can now announce that at 1:30pm on Wednesday 27th of March 2019 a little man came into our lives. Baby is doing wonderfully. He loves cuddling, sleeping, feeding and pooping. Which, for a baby, makes him just about perfect. Mum is recovering after suffering complications. She is making progress and is expected to be discharged on the weekend. Big sister is cautiously excited but says she isn't interested in changing nappies. Love from our family to yours. My baby girl had a single umbilical artery and even though she was full term, she was born slightly smaller at 2.99kg. She is 27 days old now and overall she has been good but of course the night time feeds/nappy change has given us a good dose of sleep deprivation. Congratulations to you and family. Happy to hear about the new addition. He looks great! Having kids is crazy stressful, isn't it? I *still* check that my daughter is breathing several times each night... And she just had her 5th birthday. I'll likely keep doing it until she moves-out; if I ever let her. We've been home 2 days now. So far so good. We have a mid-wife coming over tomorrow to check on mum and bub. Send me a message if you ever want to discuss anything. My wife had a cesarean and recovery is very slow so she can only feed baby, everything else is on me. But it's an amazing experience and we are having so much fun! Congratulations and best wishes for your wife’s recovery. How did I miss this thread! That's fantastic, mate. Congratulations on the new addition to the family - you'll have a proper reference for a BBS shave now.